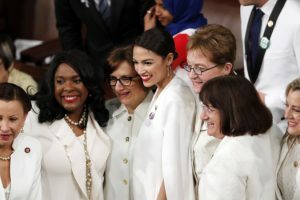 Home » Fashion » Why did the Democrat women wear white to the State of the Union? From Speaker of the House Nancy Pelosi to hot shot New York congresswoman Alexandra Ocasio-Cortez, the White House was a sea of oppositional ivory for President Donald Trump's address on Tuesday, local time. "Last year Melania Trump wore white – it highlights it's not a controversial colour, it's considered a way to honour your sisters and the groundwork they did as opposed to making a protest."